Please support our advertisements at StreamingSoundtracks.com. If you click here first to purchase an item from one of our sponsors then we get a small commission. Amazon.com - Before purchasing anything from Amazon.com, please do so via the links here at StreamingSoundtracks.com. We get a small kickback from anything you purchase even if it's non-soundtrack related. We accept Amazon.com's payment in gift certificates, so each quarter we use that in return to purchase new soundtracks. Sponsors - You can also see what our other sponsors are about to help support SST. Donate Bandwidth - Bandwidth is one the greatest contributions that we can receive. If you are in a position to be able to donate at least 1Mbits upstream please contact us. Spread the word! Tell everyone you know about StreamingSoundtracks.com! 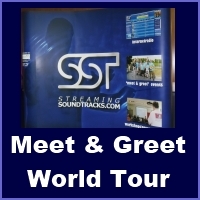 Link To SST - If you have a website and want to promote StreamingSoundtracks.com we have a large number of buttons and banners you can use. You can even hotlink our images to save your bandwidth. Recommend Us - Email your friends about StreamingSoundtracks.com! SSTore - Purchase SST merchandise. We do not mark up any of the prices, the promotion is enough for us. Send Content - You can send your soundtracks in to be added to the playlist. Only original CD's are accepted. Please do not offer CD-Rs and MP3s. Individuals can send content as well as artists and record labels wanting to gain exposure. Please check with us before you send content in so we make sure it is appropriate to add to the playlist. You can send content the address on the Contact Us page.